The European Central Bank (ECB) pushed its deposit rate to minus 0.4 percent in April 2016: Since then, euro area banks must pay 0.4 percent per annum on their excess reserves held at ECB accounts. This, in turn, has far-reaching consequences. To start with, banks seek to evade this “penalty rate,” especially by buying government bonds. That inevitably pushes bond prices up and lowers bond yields. Moreover, the ECB keeps monetizing government debt as well. The result is a tremendous downward pressure on the yield environment. 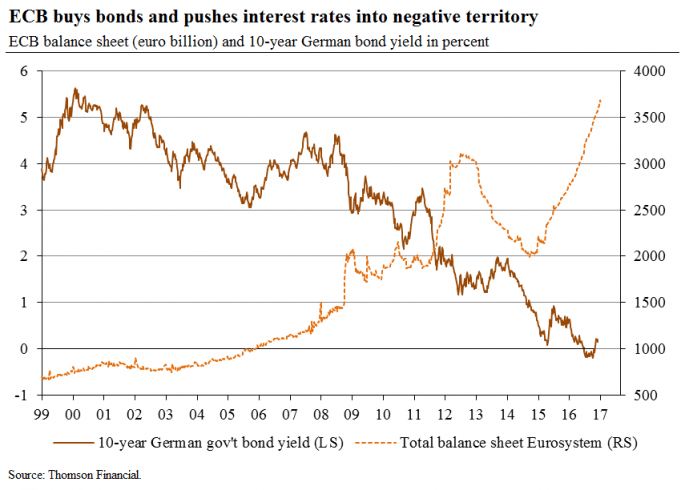 For instance, the real (inflation-adjusted) return on short-term German bonds currently stands at around minus 2.5 percent per annum. Negative interest rates (both in nominal and real terms) contribute to lowering the debt burden of financially overstretched states and banks. In fact, negative interest rates force the ratio between outstanding debt and gross domestic product to shrink. Such a monetary policy benefits borrowers at the expense of creditors. The latter has to foot the bill. At the same time, however, Eurozone banks’ businesses suffer from the ECB’s negative interest rate policy. On the one hand, they find it increasingly difficult to remain profitable in an environment of extremely suppressed interest rates. On the other hand, banks run into higher costs due to a negative ECB deposit rate (and the costs keep rising as the ECB creates more and more excess reserves in the banking system). Banks are under pressure to impose negative rates on client accounts. Given negative deposit rates, however, clients are most likely to withdraw (at least part of) their deposits in cash, and banks could experience a (huge) cash drain, resulting in a funding gap. They are therefore likely to increasingly push the ECB to end the policy of keeping the deposit rate in negative territory. If the ECB relents (and it is likely that it does), it would presumably bring the deposit rate back to zero. This, in turn, would bring all bond yields back up and above the zero line. To prevent the interest rate from rising too much, however, the ECB would have to continue manipulating long-term bond yields. This can be achieved by continued bond purchases. 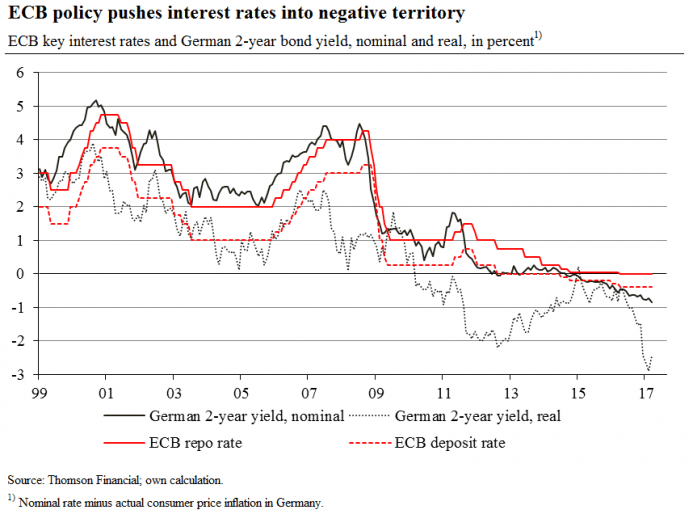 The ECB can set long-term yields at politically desired levels. It simply declares a certain minimum price for bonds. The market prices of bonds will converge towards the minimum price and will not fall below such a level. 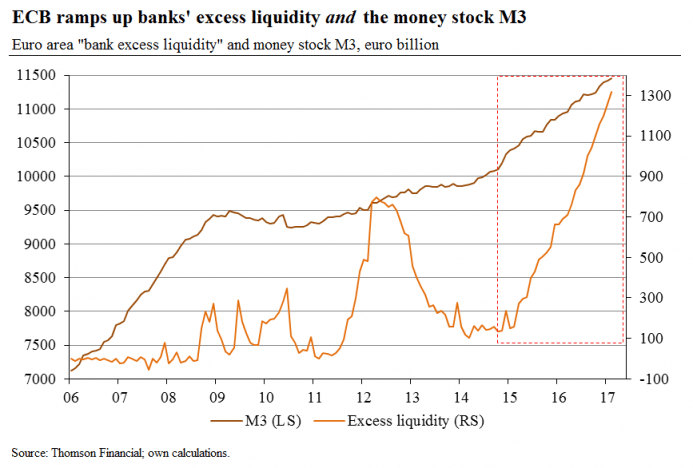 By monetizing debt, the ECB expands the outstanding quantity of money, driving up inflation at the same time. The new regime will most likely look like this: Eurozone bond yields in nominal terms will go up slightly. Inflation will also go up, reaching or even exceeding nominal yield levels. This, in turn, will force real returns (that is nominal yields minus inflation) into negative territory. If inflation does not go up too much, most depositors and investors can be expected to stick to their fixed-income holdings. The new interest rate regime would indeed be positive for ailing euro area banks: The yield curve would remain sufficiently steep, which should turn out to be profitable for banks in terms of lending. At the same time, the negative short-term interest rates help to debase their liabilities against depositors and investors. 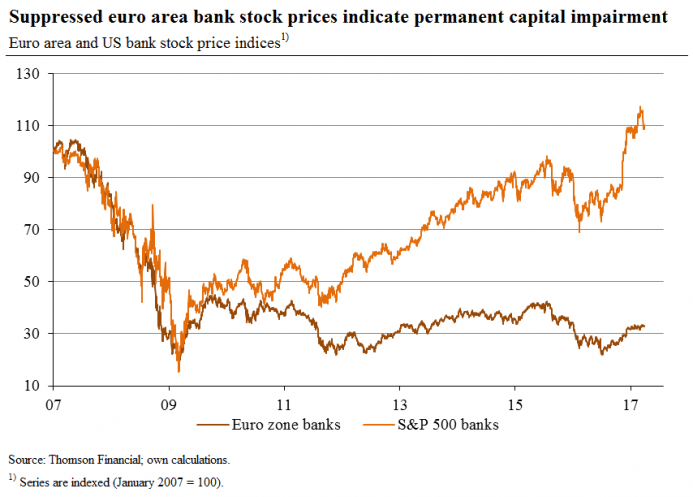 In fact, the ECB policy would amount to a large-scale bank bail-out program. In the light of the political desire to keep the euro together, the ailing Eurozone banking industry can be expected — as a necessary condition — to be bailed out by the ECB. It seems therefore likely that the ECB will end its policy of a negative deposit rate sooner rather than later in favor of increasing inflation. Such a policy will entail an ongoing debasement of peoples’ life savings in euro-denominated bank deposits and bonds. *Dr. Thorsten Polleit, Chief Economist of Degussa and macro-economic advisor to the P&R REAL VALUE fund. He is Honorary Professor at the University of Bayreuth.